Alisa Weilerstein (born April 14, 1982) is an American classical cellist. She was named a 2011 MacArthur Fellow. Weilerstein was born in Rochester, New York. She started playing the cello at age four. She made her debut at age 13 with the Cleveland Orchestra playing Tchaikovsky's Variations on a Rococo Theme. As a soloist she has performed with a number of other major orchestras on four continents. She also is active in chamber music and performs with her parents, violinist Donald Weilerstein, (the founding first violinist of the Cleveland Quartet) and pianist Vivian Hornik Weilerstein, as the Weilerstein Trio. The trio currently resides at the New England Conservatory in Boston. Her brother is the violinist and conductor Joshua Weilerstein (born in 1987). She is married to Venezuelan conductor Rafael Payare. Weilerstein has received a number of honors. In 2000-2001 she won an Avery Fisher Career Grant and was selected to play in the ECHO "Rising Stars" program and Chamber Music Society II, the young artists' program of the Chamber Music Society of Lincoln Center. In 2004 she graduated from Columbia University in New York City with a BA in Russian history. In 2006 she was awarded the Leonard Bernstein Prize at the Schleswig-Holstein Music Festival. In 2011 she received a MacArthur Foundation "genius grant". A champion of contemporary music, Weilerstein has worked extensively with Jewish composers Osvaldo Golijov and Lera Auerbach, as well as with Philadelphia composer Joseph Hallman. She performed the New York premiere of Golijov's Cello Concerto "Azul" at Lincoln Center's Mostly Mozart Festival, the world premiere of Auerbach's 24 Preludes for Cello and Piano at the Caramoor International Music Festival, Auerbach's transcription of Shostakovich Op. 34 for Cello and Piano at the Schleswig-Holstein Musik Festival, and Hallman's Cello Concerto with the Saint Petersburg Philharmonic Orchestra. In May 2016, she premièred Outscape, Pascal Dusapin's second cello concerto, with the Chicago Symphony Orchestra, to positive critical reception. In March 2017 at Symphony Hall, she performed the world premiere of Matthias Pintscher's concerto for cello and orchestra "un despertar" with the Boston Symphony Orchestra to critical acclaim. She plays a 1790 William Forster Cello. Transfigured Night: Haydn & Schönberg. 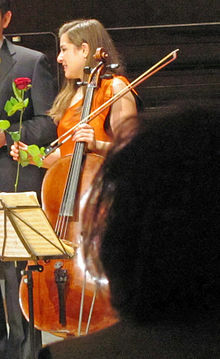 Alisa Weilerstein, Trondheim Soloists. PENTATONE PTC 5186717 (2018). Joshua Bell, Awadagin Pratt, and Weilerstein perform Felix Mendelssohn's Piano Trio No. 1 in D minor, Op. 49 – 4. Finale: Allegro assai appassionato, at the White House Evening of Classical Music on November 4, 2009. ^ "Alisa Weilerstein in rehearsal with Jonathan Gilad at the 2008 Verbier Festival". YouTube. 2008-07-22. Retrieved 2012-08-07. ^ "Donald Weilerstein Biography - The Banff Centre". Banffcentre.ca. Retrieved 2012-11-26. ^ "He's got rock star looks and a very famous cellist wife ... meet the conductor about to make a baton charge on the Ulster Orchestra". Belfast Telegraph. 2014-09-26. ^ "2011 MacArthur Fellows Alisa Weilerstein Cellist". Archived from the original on September 23, 2011. Retrieved September 20, 2011. ^ "The St. Petersburg Chamber Philharmonic | Concert Seasons | 2007-08". St-pcp.org. Retrieved 2012-11-26. ^ Rhein, John von. "Weilerstein compelling in world premiere of Dusapin cello concerto with CSO". ^ "Weilerstein Excels in New Dusapin Concerto : Seen and Heard International". ^ "With a world premiere, BSO and cellist Alisa Weilerstein explore the edges of dreaming - The Boston Globe".